This member of the finch family is a winter visitor; it is sometimes mistakenly identified as a Chaffinch, but its colours are much more orange and its head a lot darker. As with other finches, the male is the most boldly coloured. Female Bramblings are browner. 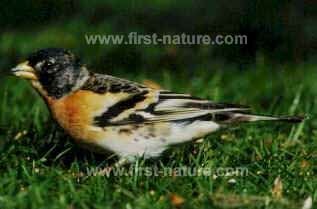 Bramblings are very fond of beech mast - the beech nuts that ripen in autumn. They also eat insects and their larvae, as well as small seeds. Most commonly seen in woods and field margins, Bramblings do sometimes come into gardens along with chaffinches and other members of the finch family. Pictures shown on this page were kindly contributed by Melvin Grey.